Attorney Peter Sachs (www.dronelawjournal.com) has started a fundraising campaign for legal funds to challenge the FAA's interpretive rules for commercial use of UAVs. Peter has already collected a couple thousand dollars on his website (http://dronepilotsassociation.com/), but we need more momentum to get this going. As such, an Indiegogo campaign was started today to help this get more visibility and, hopefully, more traction. As many of you know, the current FAA interpretive ruling effectively blocks ANY commercial use of UAVs, and a very good portion of us have a financial interest in making sure this doesn't happen. Time is running out to legally challenge the FAA's June 25, 2014 Interpretation of the Special Rule for Model Aircraft. If not successfully challenged before August 25, 2014, drone pilots will be barred from operating commercially, barred from flying in "first person view," barred from operating within 5 miles of any airport without prior permission and will suddenly be subject to all Federal Aviation Regulations. Would really like to see this succeed, and I hope all the others affected by this will contribute as well. 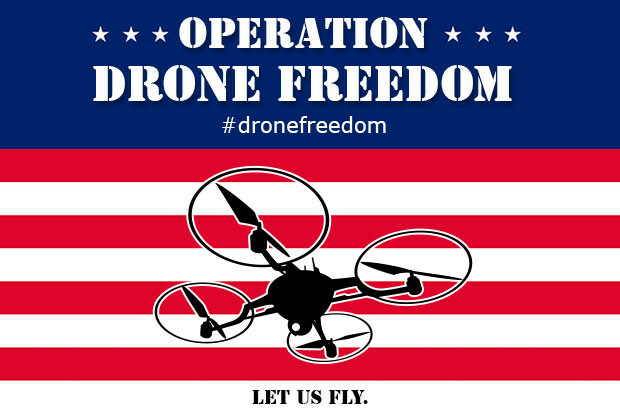 I would encourage everyone affected to spread this through your social channels, and maybe use the #dronefreedom tag to get this going. Can we please stop the FAA announcements and rants. I appreciate Americans, are unhappy but as a non American, it would be nice if they thought and mentioned the other places that have similar problems with their respective authorities. Theres an entire world outside America. Why? I like knowing what's going on where the faa and uavs are concerned. This is one of the best sources for no hype information. As far as the rest of your comment I would like to think most Americans know that they're not the center of the world but even though we are going to focus on our problems first. @mP1 - I think it's a bit unrealistic to assume that the rest of the world is completely isolated from the effects of the FAA's decisions. An open drone industry in the US would be a strong contributor to UAV research and development worldwide, with positive effects for every UAV operator. @mP1 I understand where you are coming from, but Americans face a real problem right now that is about to get much worse if nothing is done. I am quite certain blog entries about issues faced in other regions would be approved as well if you were so inclined to write about them. Most posts are basically the whinge, nothing new is really learnt. On the hardware and manufacturing side, practically everything comes from China by such a margin one could almost say 99% and be reasonably accurate. Pixhawk came from Switzerland. In terms of software, America is a minor player. The APM family of projects has more contributions from Australians than the rest of the world. DJI is chinese, Naze from Japan and so on. America contributes hardly anything to the world of drones that you and me exist in. The only place they are leaders are in military drones, and to be honest, i couldnt care less in their businesses of death and violence. Given the American governments eagerness to cut off exports, why would a non American care even if there was something exciting for the hobby market if your own government wont let your businesses send it over ? You are overrating American importance which is precisely the point. Most of the world ignores America and its stupid laws, like guns etc. I come here to learn about new cool stuff happening in the hobby that i can personally use. One story here and there about the FAA is fine, but when half the stories on the main page every day are about the FAA its over the top. Its down right boring. If you want to talk about the FAA make a start a new forum for that. There are many other places with FAA like problems and they create local forums. The cool stuff is getting lost from the main page with these local stories. The story about zero pids will eventually disappear because of another boring FAA story and thats a shame. Ouch. Why the hate for America? We don't all fit the stereotype. No the cool stuff is still there. Just extra stuff to read about. Sorry you have to sort through extra posts. @mP1 It is really easy, don't click or read anything you don't wan to. If you got a problem with our battle GTFO read something else. Because once the FAA has made its choice it will trickle down, the FAA is looked upon from the other countries as the authority and we have the strictest standards in maintenance and accident investigation. If your country does it better great no one cares. Because its boring and lack of manners to post in the wrong place. Local problems should not go on the main board or whatever this is called. Everybody could whinge about their government. Drones are banned in Spain, but we dont hear them posting the same thing over and over again waving their hands for attention. Learn from manners from our Spanish friends and all the other countries. This is not an American board, this is a world community. Learn some manners and tone down on the arrogance. You dont own the world stage. This is precisely the attitude that offends a lot of people. Everybody could whinge about their government here, but most of us have the manners not to bore everybody with their problems. Take a clue from the non American audience. Look at the Spanish drones are banned there and they dont cry every day. There are probably problems related to drones in China, but they have the same grace. Something that Americans like yourself should learn. Not true, different countries make their own laws for their own reasons. Australia might not have the best but its certainly better than America's a record of zero deaths cant be beat. Qantas has never had a crash and is the second oldest airline in the world. In the jet age nobody has ever died on an Australian plane. Sure we are smaller but you cant beat zero. Care to revise your statement ? Wheres the arrogance? I'd like to see some other country come in and investigate an accident, everybody whines and calls in the FAA to sort their problems, saving money, saving lives, I don't see Australia getting called up for anything. Also if Qantas didn't have a perfect record I doubt those precious tourist dollars would make it in your pocket. I'm not revising anything, world community or not. Easy enough not to comment or look at anything, like I said before... .
A WhoIs look up search indicates that Chris Anderson an American on Godaddy servers owns this forum. I would think that the American battle would be at the forefront of discussions on this page, so welcome to our land of the free discussions of the brave.